When Maggie Doyne was in college she traveled to Nepal and saw the effect of a 13-year civil war. She saw it tearing down families and children as they struggled to survive in all the poverty. She was horrified by the situation, yet touched by the people's kindness and decided to help. So Maggie built a home and school for the children of Nepal. Maggie's supportive family and countless hardships have brought her here today. Her many virtues have helped her start the Blinknow organization that continues to help kids around Nepal. Maggie Doyne's supportive family has helped her out a lot. She was born into her loving family on November 7th, 1989 in New Jersey. Her supportive family of her mom, dad and two sisters has helped her get to where she is now. Even though her family doubted if the home and school would work they still supported her all the way through. Now she is twenty-nine and is a proud mother of 51 adopted children. Countless hardships have brought Maggie here today. Maggie was once at a point of her life that she didn't know what to do with herself. She couldn't decide if she wanted to stay in college or take a break year and go somewhere else. She wanted to do more with her life, not just finish college and get a job. One other hardship Maggie continues to have is being exhausted from taking care of her children in Nepal. Even though all this is very hard she believes that she has to keep going. Maggie started the Blinknow organization to help the children of Nepal. One of Maggie's many accomplishments are building a home and school for the children of Nepal. She was so determined to help that she used her life savings of 5000 dollars . After this, Maggie decided to further help and founded the Blinknow organization. Even though she has done all this, for Maggie hearing her kids scream "Mom!" is her greatest accomplishment. Maggie's many heroic virtues have helped her out tremendously . One of them is her vision to end all poverty with kindness. She wants to help wherever she can to make other peoples lives better. She also has tons of determination to do this and keep being happy at the same time.The last way she has so much bravery, determination, and kindness is building the home and school for the children in Nepal. Even though a teenage girl of the age 19 usually doesn't do these things, Maggie didn't care and went on to make this happen. Maggie is just like any other girl. A girl with a dream to end poverty. She is a true hero to me because she helped and continues to help with no regrets. She continues to put down her time for helping her children and all the children out there. She inspires me to help, even though it can be hard. TEDxBrussels - I got some info from this Website. It helped a ton with this project. 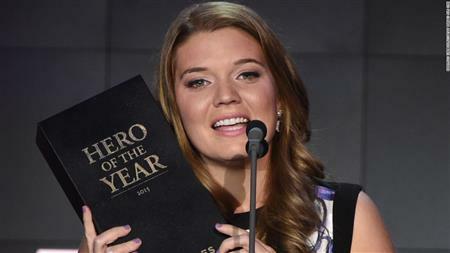 CNN heroes - I learned about Maggie Doyne on the website.